Peer groups can heavily influence a teen's outlook and behavior. The easy answer to "do friends change a teen's attitude" is "yes." Teens consider the influence of their friends to be critically important -- giving more weight to their peers' opinions than to their parents', notes the article "Your Teen's Friends." Where things get murky is in determining whether those friends are changing the attitude for better or worse. When a teen chooses friends who have positive attitudes, the teen is likely to develop a similar emotional response. Kids who are a positive influence tend to get good grades, have a strong relationship with their parents, don't use drugs and have a favorable attitude toward the world in general. Being surrounded by kids who seem to handle the minefield of the teenage years encourages others to rise to the occasion and do the same. Developing a negative attitude is likely if a teen is hanging out with friends whose outlook and behavior tend toward the not-so-great. Kids who use drugs, have contentious relationships with others or don't have respect for schooling or adults can spark negativity in those around them. This is especially true if they are older teens influencing younger ones. Traits associated with being negatively motivated include poor decision-making skills, engaging in risky activities and an attitude that ranges from indifference to aggression. The term "peer pressure" is often thought of as negative. In reality, however, it is a neutral concept that can be used for good or evil. When peer pressure is used to negatively influence a teen, the teen might experience anger at being targeted to do something he doesn't want to do, fear of consequences for noncompliance and guilt for having caved. Positive peer pressure is good remedy for those attitudes. Teens who find friends who set the bar high for positive interactions and goals can be inspired to behave likewise. The level of risk posed by a chosen circle of friends can change a teen's attitude. Risk is not necessarily determined by outward appearances. A teen who possess the characteristics of a positive attitude, like good grades and a healthy home life, may be living a secret life of poor choices and risky behavior. 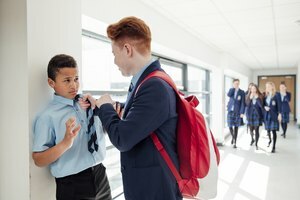 Spending time with kids who sneak out at night, lie or bully can have an effect on the attitude of teens who would otherwise not engage in that kind of behavior. Smith, Sharideth. "Do Friends Change a Teen's Attitude?" Synonym, https://classroom.synonym.com/friends-change-teens-attitude-21414.html. Accessed 18 April 2019.